Your scenery piece looks good "in action", although it is sitting there as all good scenery pieces should. Time to change the name I guess. 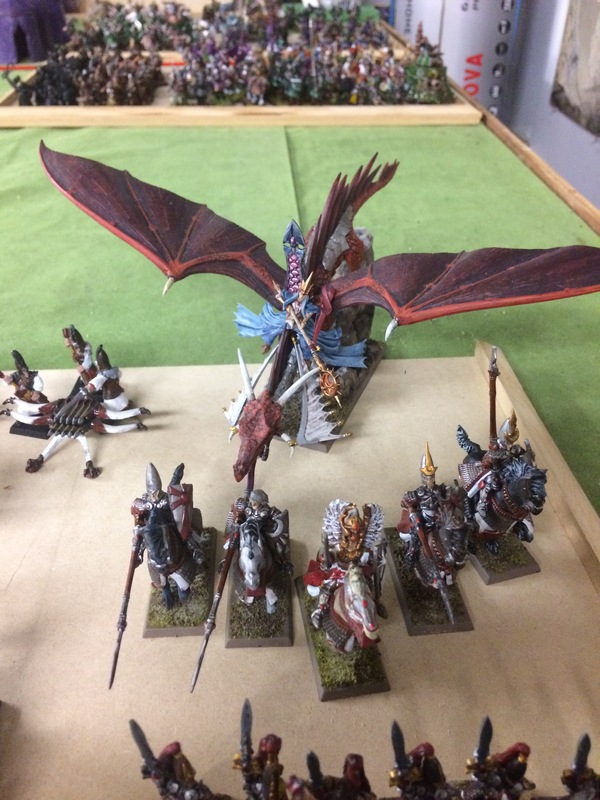 Next up I would like to make my shadow warriors and orc boss on a wyvern next. There is so much rebasing to do so I think I'll just pick a couple of warbands to start. The new handbook also changes up the Aelves so they should be fun. Seeing as the aelves are back. 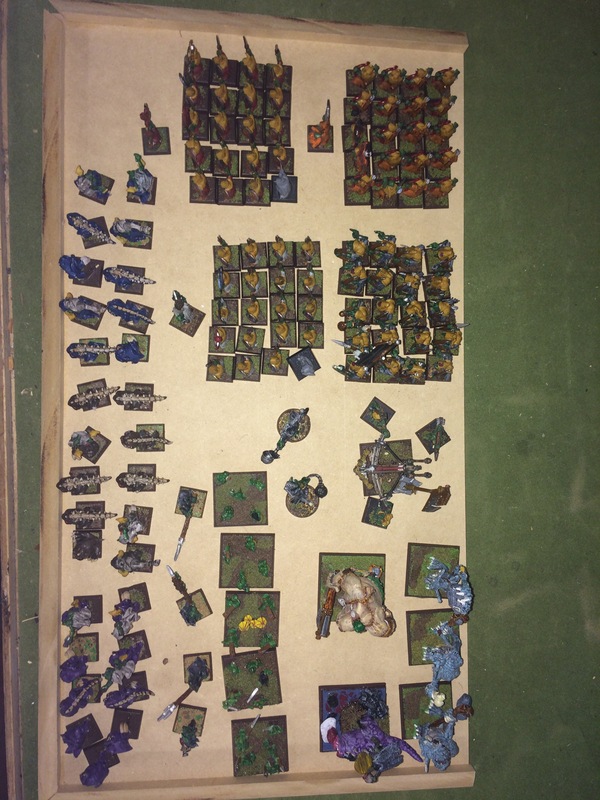 It's time to pull out my old army. I thought I had more BL units but alas. 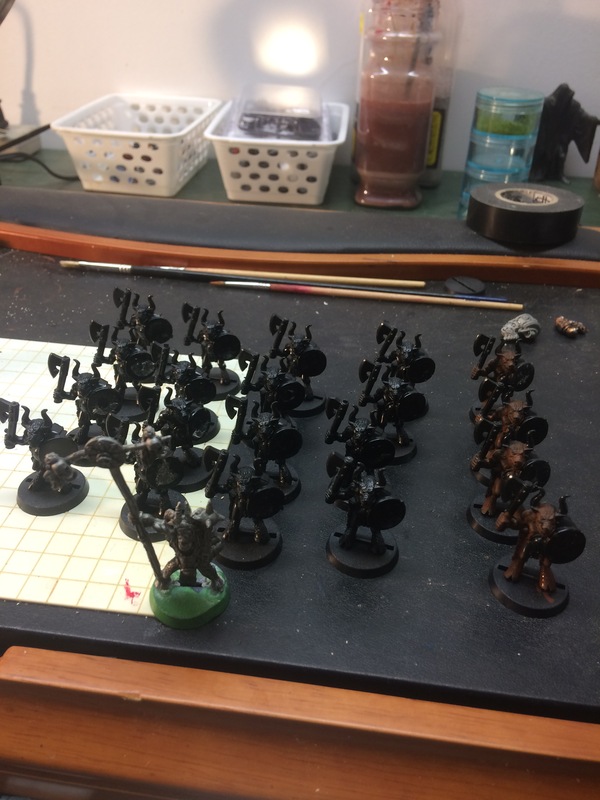 I found some reavers too that are unpainted so I should do them up too. Sweet! Are you going to rebase them also? I've found a Chinese company. 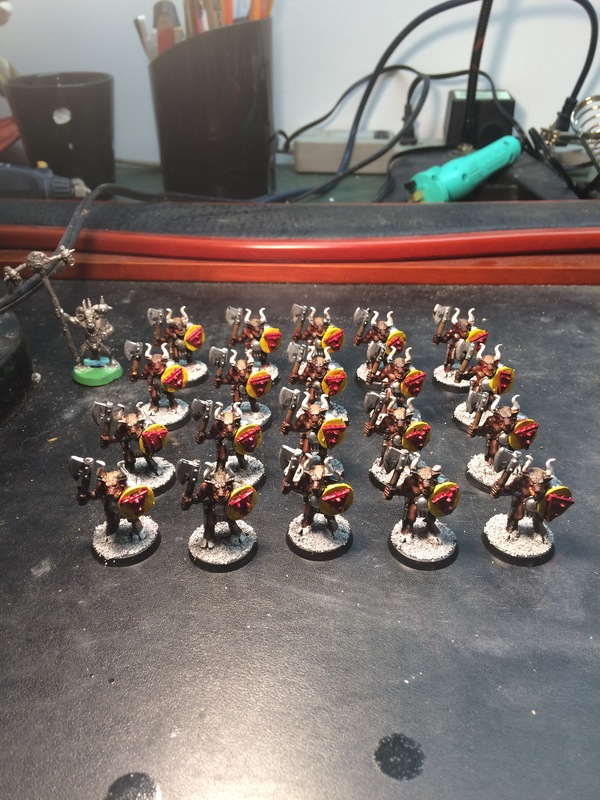 100 25mm bases for 10.00 free shipping. They really need rebasing. There is a lot of wrk in that so I'll be selective in what I choose but I really like this army so it's worth it I think. Original fluff was a small army tracking down lost clan artifacts in the chaos wastes and the've been gone along time, hense the weather beaten look. Now I can change them to be from a shared city state of aelvin / human coexistence. I'll fill in the gaps with pilgrimage type or a reworked freeguild group. Love swordmasters! What a great looking force. I look forward to many more great pictures! This was my next to last army I painted and I actually liked the result. They were also the hardest to paint as well. 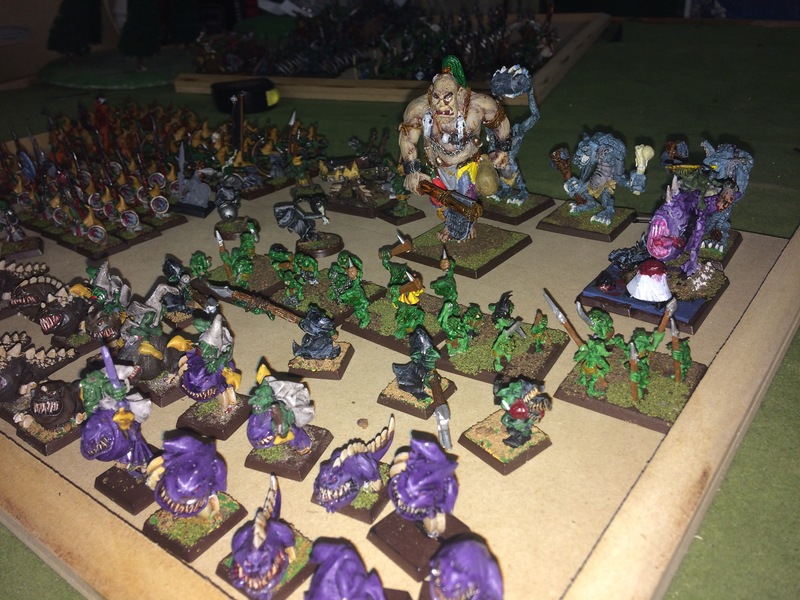 My last army was a full goblin army centered around squig hoppers and a mangler bash as I couldn't afford the awesome kit. I got tired of the conversion and stopped with the idea one of the manglers broke free lol. I used the body of a cold one with the idea of doing 2. The other one remains untouched. 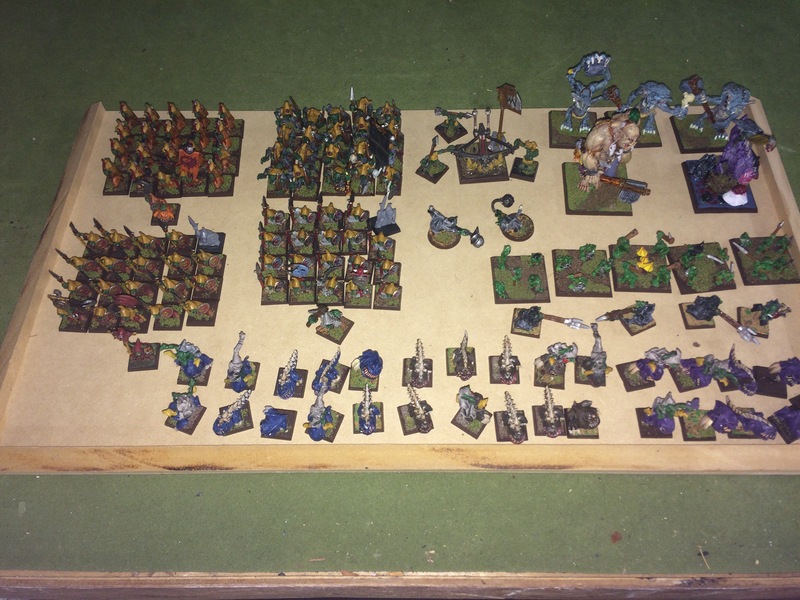 I'll drag out the gobbos but there's over 115 models lol. It will take awhile. Edit: cripes! Just realized that was an elf that got munched. 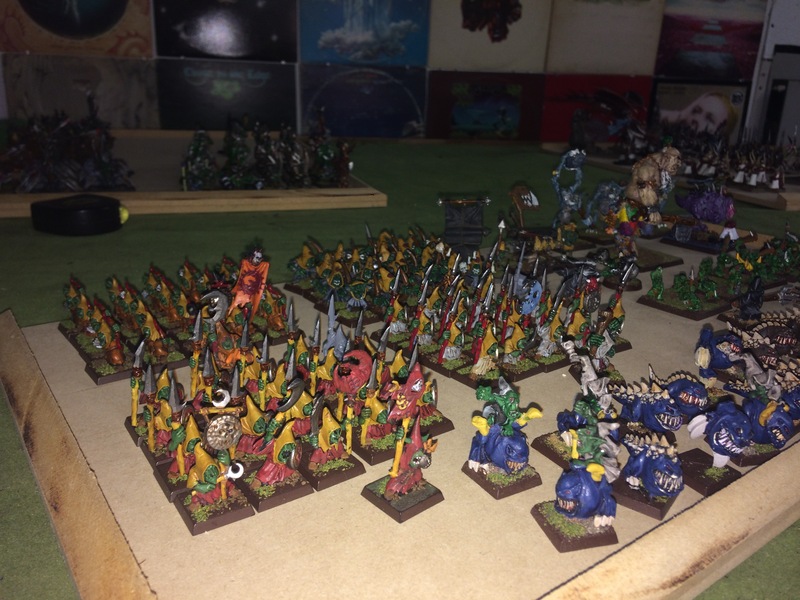 Managed to dig out the gobbos. 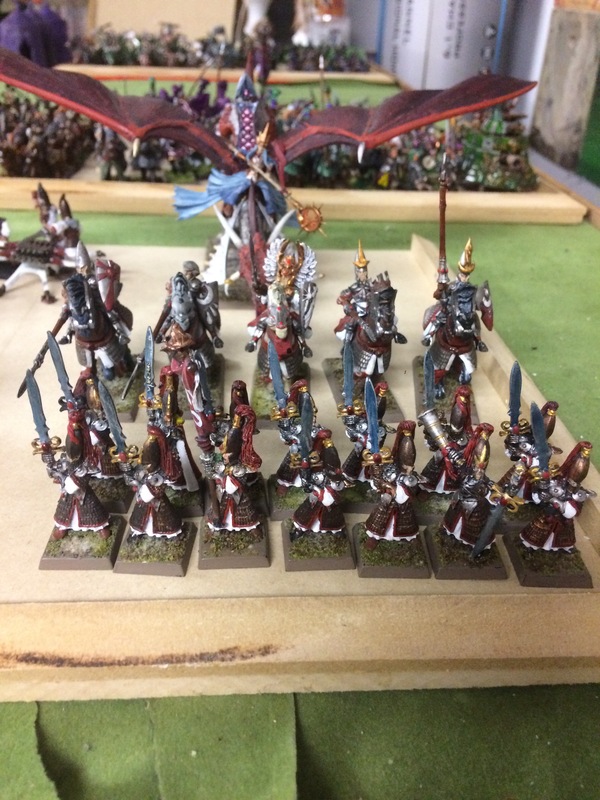 This army was absolutely guaranteed not to win at tournaments but I brought them anyways. Could Never round up enough hoppers so I mixed in regular squiqs as fillers. Maybe no wins, but a funner army I've never known. Probably my favourite. 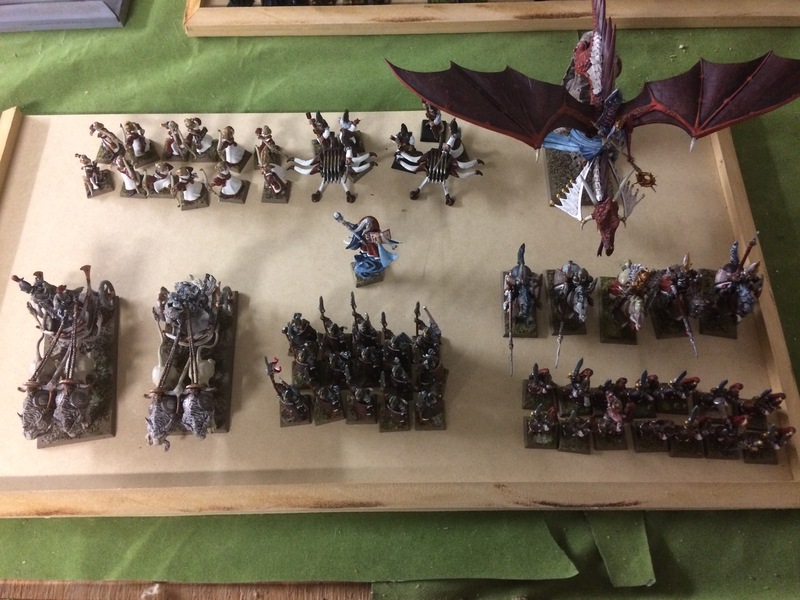 The movement trays are somewhere but I'm not to concerned. Batches of these guys wil go AoS eventually. I lost a purple hopper somewhere along the line. Pretty sure it was the cat. Really cool, fungal feel to these guys. 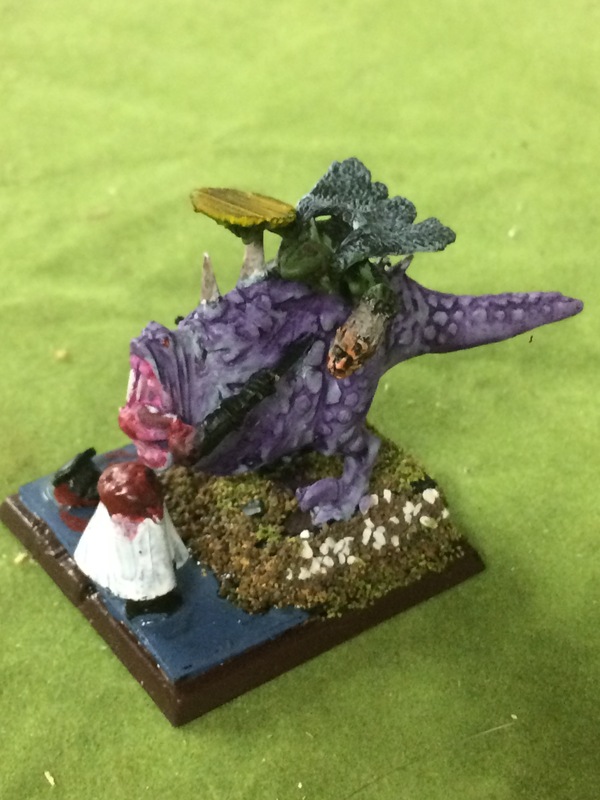 I dig the purple squig. Cool stuff! Not sure about skaven yet. From what I've read, they do seem very squishy. The idea came from one of the realmgate novels with the two groups working together and as I have a spare skaven battalion kicking around lol. Maybe the beastmen will lead the punch but I'm not sure of synergies between the two. Here we go! My first AoS unit. 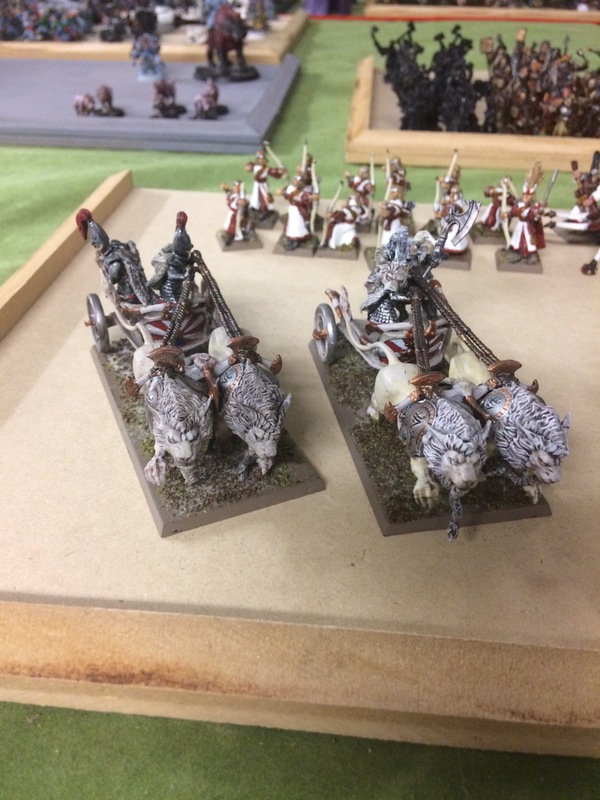 Strangely it's a beastmen/ skaven unit of twenty battlemaster (GW Gors I would guess). The idea came from DocJ as I was complaining about budget and this was his solution and I like em. 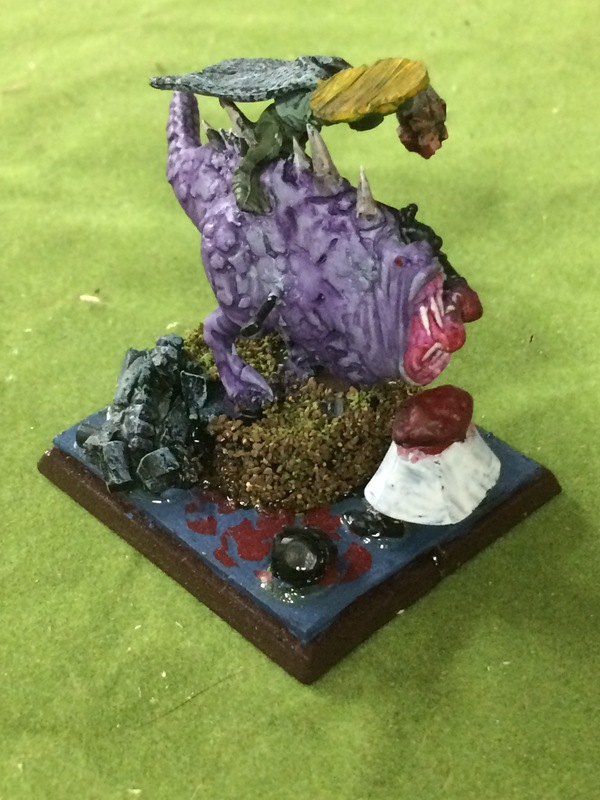 They had this big round shield area so I thought I would throw a skaven shield on top which I think worked out and ties in the relation of these smelly creatures with their scurvy packmasters. A good match in all. Inspired by Warbeast by Gav Thorpe. Should be a fun army. Somehow the uniformity of these guys makes them really intimidating. That's exactly what I thought! When I first got them they seemed small and let like but they actually look pretty strong when there done. Yup and that standard bearer dude on the left really helps with that feel. He almost looks, like he's directing the herd. Great job Artoban. Looks like the standard bearer needs a bit of paint to bring him to life. Go slow and steady, make him connect with the others, but have him stand out, too. Maybe hang some things from the banner. Yellow and red pennants?